The Rock erosion node simulates realistic rock erosion through a series of iterations on the entire terrain that determine the movement of sediment due to gravity. This type of geological process is sometimes referred to as thermal erosion, thermal shock, material slippage, or talus deposition. The simulation creates an accumulation of sediment at the base of crags, mountain cliffs, volcanoes, or valley shoulders due to small portions of the material from adjacent cliff faces crumbling and piling up at the bottom of an incline. Currently, increasing the number of iterations creates more erosion while decreasing the number of iterations results in less material transport. To add a Rock erosion node, right click in the Graph Editor and select Create Node > Simulation > Rock erosion. Number of iterations: Sets the number of iterations. Angle of repose: The internal angle between the surface of the deposit and the horizontal surface. This talus angle depends on the material; for example, a classic value for sand-like sediment is 33Â°. Material with a low angle of repose forms flatter piles than material with a high angle of repose. Initial sediment: Coefficient that describes the quantity of rock that is initially transformed into sediment. Roughness: The way the sediment stabilizes: a low value creates smooth planes of sand-like deposit whereas a high value introduces asperities. Display sediment: Toggles the display of the sediment layer. The tile being calculated is highlighted and surrounded by a red frame. This is only visible if the erosion parameters window is open. As with any node with the bi-color (blue-yellow) optional connector, it is possible to drive some of the Rock erosion node parameters with the help of a mask. An additional mask can be found in the optional connectors. The Sediment removal mask describes regions where the sediment is drained out of the simulation. 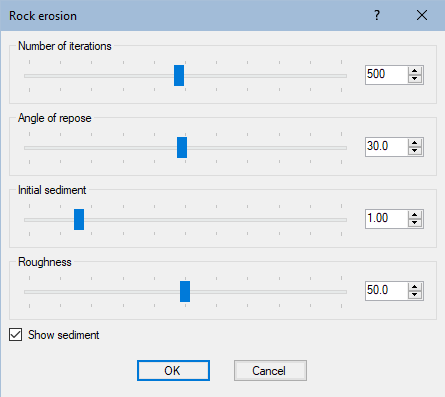 Use this feature to limit the effect of the erosion to a subset of the terrain. Since Instant Terra uses a non-destructive workflow, you can modify a painted mask in the erosion node: each time the painted mask is modified, the simulation will rerun from the start and provide a deterministic result. See Connectors and links for details on the optional connectors.